I prepared this recipe specially for my participation in one of the spring issues of the first Bulgarian online blog magazine SOintoFOOD. I had the honor to be invited to participate with three recipes, which I prepared with a lot of love and inspiration. For the occasion made a version of my favourite recipes for zucchini quiche that I make pretty often… I love cheese and eggs and the quiche is the just the dish to use the leftover vegetables and sausages (for the meat eaters) in your fridge to make it. Simply add some eggs, cheese and cream and you’ll end up with delightful filling and buttery dough that’s super delicious is also so easy to make. 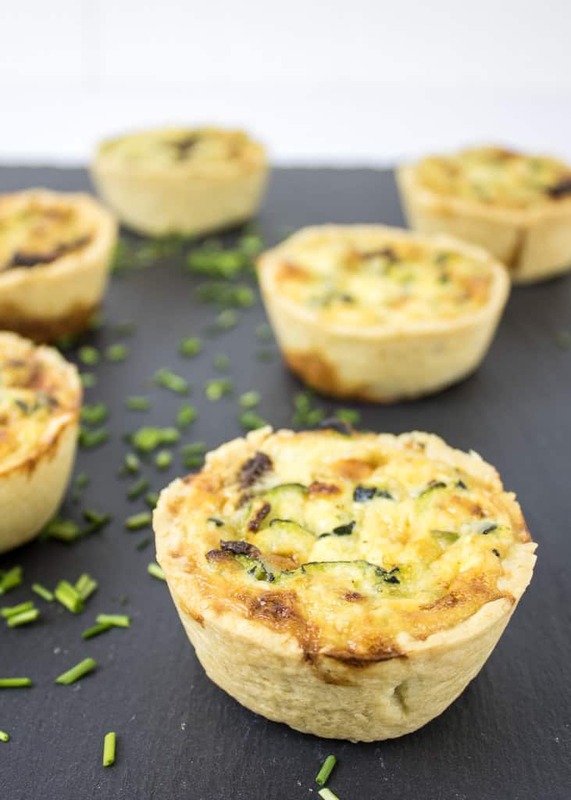 These mini quiches were made with grated zucchini and cheese; you can use different kinds of cheese for more interesting taste. I used a muffin tin for baking them and ended up with 12 pieces. They are really great as treats for the office, a friends gathering or to enjoy by yourself :). 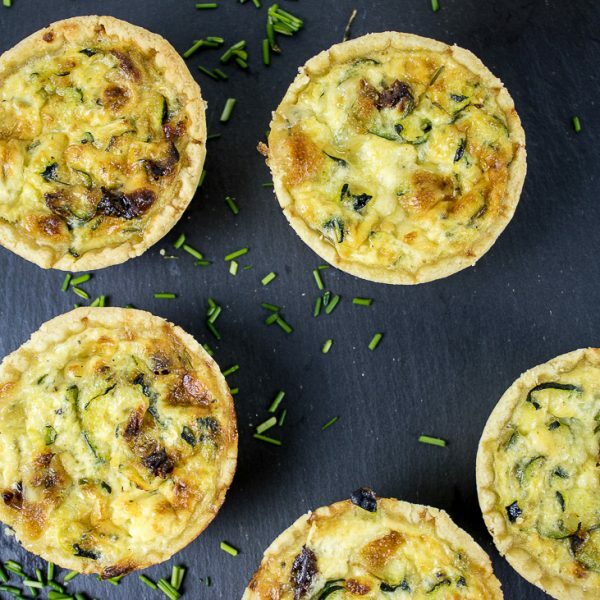 Mini quiche with zucchini and cheese for the little ones and the grown ups. Great snack for at home and for parties. Grate the zucchini, add a little bit of salt and leave until the water separates. In a bowl add the flour, egg yolk and the butter, which you’ve cut into small pieces. Knead well with your hand and gradually add the water. If the dough is too sticky, add more flour. The dough may be slightly friable, but this is normal, knead gently and form a ball, then put it in the refrigerator for about 30 minutes. Drain the excess water out of the grated zucchinis by pressing them into your palms. Put the drained zucchini into a bowl. Chop and add a little green or wild onion, some finely chopped sun-dried tomatoes, grated or broken into pieces cheese. Season with nutmeg and add the cream. Stir well. Remove the dough from the fridge and roll it out to 1/2 cm thick. Depending on the size of your muffin cups, cut out circles of the dough and put them into the tin, then press to the walls, using a spoon. My muffin cups are 6 cm in diameter. I cut circles with 10 cm in diameter, using a glass bowl and they fitted pretty good. 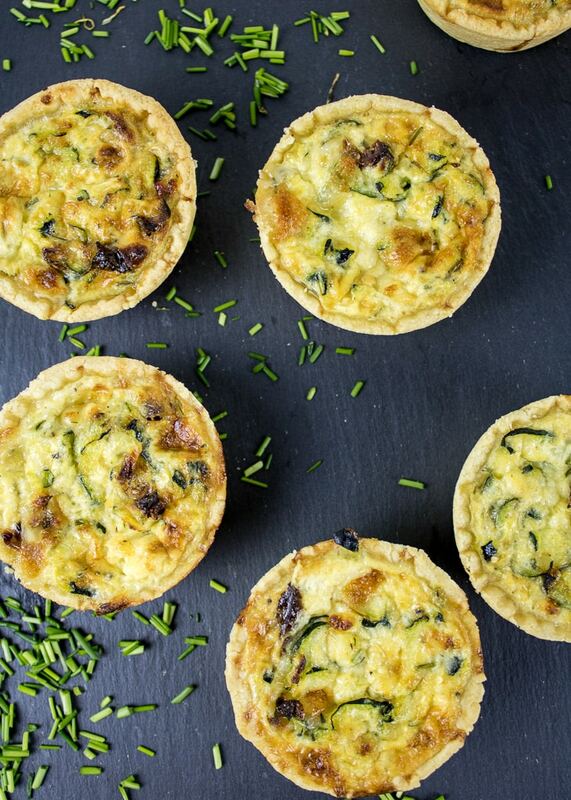 Divide the mixture of zucchini and cheese into the mini quiches and bake for 25-30 minutes. * You need a 12-cup muffin tin. The dose is for 12 mini quiches. They can be eaten warm but are delicious cold as well.